When I was a girl I LOVED to stay at my Mamaw's house b/c she had HUNDREDS of grown-up paperback books that she would let me read. Even then I loved to be scared, and Mamaw's gothics were my favorites! Mamaw was also my favorite, which is why I carry these old things around. 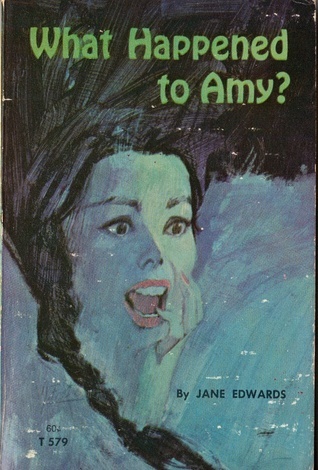 These battered paperbacks are totally worthless, falling apart even, but just looking at the melodramatic scenes on the covers (slim white woman, flowing dark hair, staring aghast over her shoulder, fleeing along the foggy moors in a freaking dressing gown!) brings back a little of the joy of being curled up ALL DAY on the daybed in Mamaw's livingroom, filled with fear from the story, but totally safe (rare for me then) in my body there with Mamaw. I was looking forward to reading this, but was so let down. It was OK for about 90 pages, but then it just became really lackluster. I no longer cared what had happened to Amy. mystery and it's so good.You get lost in the characters lif! !